Knowing how to barbecue right isn't just about slapping a pack of burgers on the grill and hoping for the best. Nope, knowing how to barbecue involves choosing the right barbecue type for what you like to cook; picking the right fuel type for you; and, of course, there's knowing how to barbecue more sophisticated foods, whether pork chops (mmmmm) or steak (yummmm). Use this guide to find out how to barbecue right, and check our guide to the best BBQs to choose the right model for your barbecue parties. Find more garden buys, advice and inspiration on our hub page. If you barbecue regularly, it's worth spending a little more to buy a durable BBQ with a decent warranty. 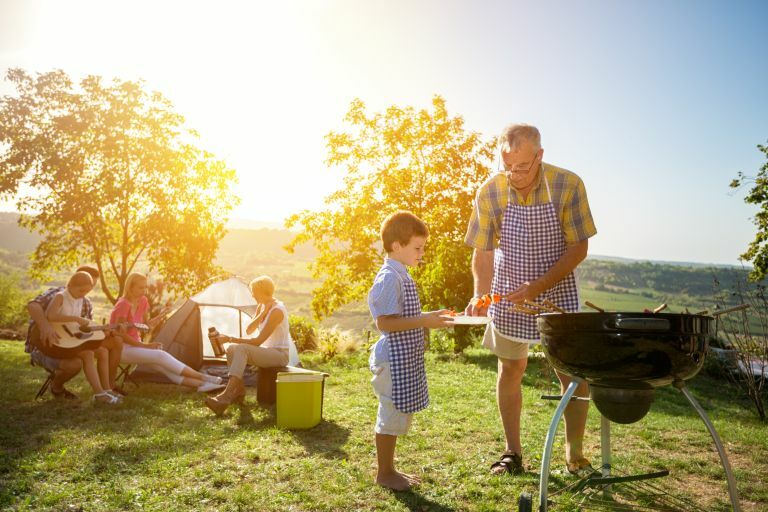 Barbecues are a classic party theme, so if you're going to be cooking for a crowd (more on that below), consider a larger model than one that could cope with the needs of your immediate family. Bear in mind that storage during winter months could be an issue, especially if you don't want it left outside – if covered up – year round. How much space do you have in the shed from October to Easter, for example? As a guide, for cooking for up to four people, you'll need a cooking area less than 1800cm²; for up to six people, choose one that's between 2000cm² to 2500cm²; for eight and upwards, go for a barbecue with a cooking area over 2500cm². Closely related to the size of your gas BBQ, the number of burners you have will give you greater flexibility. Ideally, each burner should be easily and individually controlled for different cooking levels. Like to take your BBQ camping with you? It'll need to fold down neatly. Want to drag it (safely) down the garden when you're done cooking? Wheels are a handy option. For easy maintenance and cleaning, choose stainless steel; cast iron is a popular choice, but you do need to oil the grill before and after use to avoid rusting; choose porcelain coated grills for easy cleaning and low maintenance but be aware that these tend to be on higher end models only; chrome plated grills need careful cleaning after use. Look out for grills with flavorizer bars; these will give your food an extra kick in the taste department. Useful for roasting, handy for sheltering your food from the breeze, lids and hoods need to be easy to manoeuvre so that you can get the best from your BBQ. Look for models with built-in thermometers. An optional extra with larger or higher end BBQs, a griddle can be used to keep food warm, to cook smaller items that might fall through the grills and for frying, just like you would in a pan. Charcoal BBQ, gas BBQ or hybrid BBQ? Choosing between a charcoal barbecue, a gas barbecue or even a hybrid grill comes down to more than just taste. And despite what expert barbecue cooks say, one isn’t necessarily better than the other – there are pros and cons for both. We take you through the pros and cons of each to help you pick the best barbecue for you. Going camping? You can take a light, portable charcoal barbecue with you. Charcoal barbecues are cheaper to buy than gas or hybrid barbecues. They may take longer to heat up but they can get much hotter than gas grills – that may suit what you're planning to cook, perhaps searing steak (see cooking methods below). You can't beat the taste of charcoal cooked meat (although you need to make sure you go light on the lighter fluid). The downsides of charcoal barbecues? Unlike gas barbecues that are ready to cook almost from the word go, charcoal barbecues need time to heat up – and you need to be adept at lighting them, too. A charcoal chimney (see below) can speed up this process. Charcoal barbecues are undoubtedly harder to clean than gas grills. There's not just the grease and food, but all that ash, too. If you're new to barbecuing or you only do it a couple of times of year, you'll know what we mean – smoke in the eyes, burnt burgers... Charcoal barbecues are undoubtedly more difficult to cook on than gas BBQs. And in some areas – such as apartment complexes – this is enough to lead to a ban on their use. Convinced a charcoal BBQ is for you? See our pick of the best charcoal barbecues to find a great deal. We've also reviewed the best portable BBQs for those summer camping trips. Prep the barbecue by cleaning out any old ask, removing the grate, and opening the bottom vents. This allows air to circulate around the charcoal, which will help you get an even, strong burning barbecue. Use the right amount of charcoal: the more charcoal you use, the tighter you pack it, the hotter your fire will be and the longer it will burn. Cooking a couple of burgers or sausages? You can get away with 15 to 20 coals. Searing steak? You'll need twice as much. Hosting a party? Scale the coals up per person, working with around five to 10 pieces of coal per piece of meat. Wait until the charcoal is covered with white-grey ash before cooking. This should take up to 30 minutes. There should be no smoke; if there is, the coals aren't ready. Get a barbecue temperature gauge to ensure your barbecue retains the right amount of heat. You're looking for at least 107ºC+ (225ºF). Control a charcoal barbecue's temperature with the vents: you can reduce heat, slow down cooking or lengthen cooking time, by closing down the vents almost completely (never do so completely or the fire may go out); opening the vents will create a fiercer, faster heat. Season the BBQ grill when it's cold. Use a high heat cooking oil, wipe off any excess with kitchen roll and you're ready to go. How to use a barbecue chimney starter? Hate the taste of lighter fluid on your barbecued food? A charcoal barbecue chimney starter is an upright metal tube that lets you start your coals with just some sheets of newspaper and a match. If you barbecue for a crowd (more on that later) on a regular basis, choose the largest chimney starter you can find – John Lewis's Weber barbecue chimney starter is a good choice. Its large capacity will hold enough briquettes for a 57cm diameter kettle grill. It's constructed from aluminised steel and has stay cool thermoplastic handles. Connect up the propane, turn the knob, press the ignition... and you're just about ready to cook, give or take 15+ minutes to allow the grill to really heat up. Ideally, you should pick a grill that has at least two separate burners that can be controlled individually. Don't be talked into a barbecue because it has an exceptional BTU rating; instead, look for a good quality, sturdy grills with heavy metal grates that will better trap and hold heat. Vents are another important feature. Lava rocks, flavoured briquettes and metal deflectors all stop the meat's fat from reaching the flames, which means flare ups are less likely than on charcoal BBQs. Large gas grills that can cook up a storm for a party are great, but their lack of portability is a downside if it starts raining or for when you want to hide it away. So, if you're going for a smaller model, always look out for one that has wheels. Look for BBQs made from stainless steel or cast aluminium. Both are rust resistant and will give you a longer life. No ash? It makes for a tidier clean up. The downsides to gas barbecues? Well, you need charcoal, too, but it's so much more obvious when that's getting low. Make sure you're topped up on barbecue gas before you start – and look for gas bottles that come with an indicator to tell you when supply is getting low, or a regulator, which keeps an eye on the gas pressure. Gas barbecues are more costly than charcoal, and the cost of the gas adds to this. Find the best gas BBQs at the best prices in our buyer's guide. Keep the lid open when lighting a gas barbecue. Safety first! If it is windy, make a shield to hold up while you light it. Allow the grill to heat up for at least 10 minutes. Once you've lit your first burner, turn on the others. This will allow the grill to heat up properly and will burn off any food and grease left over from last time. If it's smoking, it's not ready – so allow that grease to burn off properly first. Turn down the heat and get ready to cook. Control heat further – if your gas grill is too hot and you can't close vents or turn down the burners further, trying reducing the amount of gas on the propane tank itself. Also, keep the lid open to allow some of the heat to escape. A hybrid barbecue – you might have heard them referred to as combo grills – are at their most simple level a dual fuel option: one side of the barbecue is for charcoal grilling, the other for gas. There are, however, more combo options. A hybrid infrared gas grill is a gas grill; on one side you get traditional convection burners, and on the other an infrared burner. On this infrared burner, you can cook foods at lower temperatures as well as high. Gas smoker combo grills are another option – allowing you to cook on gas and charcoal and to smoke foods, too. See more on smoker grills below. Smoker grills are ideal for cooking food at lower temperatures, meaning you get gentler, slower cooking over a longer time, and incredibly crispy on the outside, tender on the inside meat. The other advantages of smoker grills? Smoker grills tend to have a long, horizontal chamber next to the heat source rather than above it, which makes topping up the fuel and adjusting the heat easier. That said, for first timers to smoke grills, there's still a learning process to get the cooking temperatures just right. The firebox attached to the side of a smoker grill sends smoke into the cooking chamber. The disadvantages of smoker grills? Smoker grills are trickier to use than kettle barbecues, as we've said above, and the most difficult aspect is ensuring the temperatures are right for what you're cooking. Don't rely on the temperature gauges provided (especially on budget models); instead, buy yourself a digital air probe to track temperatures. You're slow cooking, so it's going to take longer. Build this into your BBQ schedule. Find the best smoker grills in our buyer's guide. Put cold meat in the smoker: straight from the fridge will absorb the smoke better than room temperature meat. Use the smoker's vents to control heat – open them before adding fuel, and adjust them when the smoker heats up. Use a chimney starter to fire up your smoker grill. Use wood for flavour – but as a supplement fuel not the main fuel. Large pieces of wood will burn more slowly than kindling, and put them to the side of the fire, not on top to infuse. Put a pan of water on the grate; this helps keep the meat juicy. Wait until it reaches slow cook temperatures – around 107ºC (225°F). Keep the doors closed as much as possible: opening them regularly allows the much-needed smoke to escape. Use a smoker grill to slow cook for a crowd. That way, you can get the meat on well in advance of guests arriving. It's also a more economical approach and very low maintenance – no flipping burgers! Buy aluminium foil tins and containers or have plenty of large oven-proof platters handy. That way, as individual pieces of meat, from sausages to burgers, are cooked, you can transfer them to the tins and cover them with foil to keep them warm at the side of the grill (or on a low heat in the oven). Use the upper rack to keep cooked meat warm but to stop it cooking. Keep the crowd away from the barbecue: you need air to circulate or the meat will steam and toughen. Limit the amount of meat on the grill – crowding the BBQ will cause an excess of fat to drip on to the flames, causing flare ups. Cook in order – while the BBQ is at its hottest, cook the meat that can stand high heats and then sitting (steaks or burgers are a good example). It's never a bad idea to get sausages and chicken started in the oven then finish them off on the barbecue. This will ensure they're cooked through safely. Stay by the barbecue – if you get distracted you'll return to burnt burgers. Buy too much meat and too many buns – they can always be frozen if they're not eaten, but no one wants to go home hungry. Just like when you're cooking in the kitchen, what you put on your barbecue grill needs different temperatures, cooking times and cooking techniques to produce great results. Bear in mind that, in general, when the barbecue lid or hood is closed, the cooking will be faster than if it's open; and, if the meat is thicker, it will need to be cooked for longer. If in doubt, and unless you're slow cooking in a smoker or are cooking delicate foods, such as fish, it's usually best to barbecue with the lid open, whether you're cooking on charcoal or gas. We all know how to cook burgers and hot dogs, right? But other meats can be more tricky. As a general rule, fish will need a medium heat (around 200ºC to 210ºC), while steak needs a high heat (375ºC+). Use your barbecue's temperature gauge to ensure your BBQ is at the right temperature before you start to cook. Hot tip? Never press down on barbecue meat with your spatula while cooking; doing so squeezes out the juices that keep the meat tasty and tender. Steak needs a hot barbecue, but the exact temperature will vary depending on the cut of meat (the more marbling the better for barbecuing) and how you like your steak cooked. Start by cooling steaks (thinner ones in particular) in the fridge. It shouldn't be frozen but it should be firm and cold; this will help you achieve the ideal cooking result: you want to char the outside of the steak but keep the inside juicy and if it's cold it will take longer to over-cook inside. Put the cold, seasoned steak on the grill. Initially it will stick, but leave it for a couple of minutes and it will loosen off. Then flip it and repeat on the other side. Move the steak off the heat to cool a little – this will make it tenderise. Chicken thighs need a medium/hot barbecue. Why thighs? They're a fatty part of the chicken (or fatty-ish), which means they're the best part to cook on a barbecue. Start by bringing the chicken thighs close to room temperature, season them and put them on the grill, skin side down, closing the lid for around 15 minutes. Allow it to brown on the first side before you flip it and cook for another 10 to 15 minutes. Again, the meat will stick to the grill to start with but will loosen, so be patient or the skin will pull away if you turn it too early. Now open the lid and cook on direct heat for the last 10 minutes, five minutes on each side. This will crisp the skin nicely. Bear in mind that it takes longer to cook chicken (or any meat) with bones in, so give thighs and legs longer (around 30 to 40 minutes) than breasts or wings. Use your food thermometer to check the chicken is cooked inside (it should have reached 75ºC). Pork and lamb chops need a medium/hot barbecue. Start by bringing them to a cool room temperature, season and put them on the grill. Shut the lid. Flip when the meat has released from the grill – it'll need upwards of four minutes on each side, depending on the thickness of the chops (allow around 10 minutes each side for doorstep chops). Use your thermometer to check that pork is cooked through: it should be around 65ºC ideally; below 60ºC and you risk poisoning your guests, over 70ºC and the meat will be tough. Open the lid briefly to give your chops that chargrilled, just crispy finish. Follow the instructions above for pork chops. For salmon, you need a minimum fire. Start by getting your salmon close to room temperature, coat it lightly with oil, then season it. Put it on the grill and give it a couple of minutes for the meat to loosen – removing it too early will rip the fillet and you won't get that great grilled look. Once it loosens, flip the salmon carefully. You can check the salmon is cooked by trying to break it apart with a fork. If it flakes, it's ready. If it doesn't, cook for longer. It should take no more than three minutes per side, but give it longer if you don't like salmon pink inside. Yeah, we know it's not something you'll do all the time, but it's great to know how to barbecue a lobster tail for that special occasion. Lobster needs a direct, medium heat. First cut the shell towards the tail (but not beyond it) with kitchen shears, then split the lobster meat with a sharp knife along the shell cut line. Don't cut all the way through. Now rub the meat with olive oil and season. Place the lobster flesh side down for five or six minutes, then flip over for another five minutes. If you want to baste the lobster, do this next. Yes! You can barbecue pizza. You'll need dough rounds, which you can buy ready-made or make yourself at home. Shape and lightly oil, then put straight onto a lightly oiled grill on a low to medium heat. Grill the dough for a couple of minutes each side until they look golden brown. Remove to a plate and add your toppings, leaving a couple of centimetres without topping around the edges. Put the pizza back on the barbecue, close the lid and allow three to five minutes for the toppings to cook. Want to investigate outdoor pizza ovens instead? We've found the best – at the best prices.